June is a such a busy month. The Arts world begins to transition to outside the concert hall and into sheds or tents, onto public greens and other open spaces. For those of us who live in Connecticut, June is the month of The International Festival of Arts & Ideas, a two-week explosions of lectures, walking tours, theater, indoor and outdoor concerts, a cornucopia of events that take over the city of New Haven to give audiences an amazing view of what the human mind and body is capable of. That writ, this post only covers one event from the Festival. Instead, the focus is on two concerts and one recording, all of which feature cornetists or trumpeters. Here's a quick overview courtesy of www.beginband.com: "The trumpet or cornet is the smallest and highest member of the brass family. As with all brass instruments, the sound is produced by buzzing the lips into a mouthpiece. The difference between a trumpet and cornet is very minor. They both play the same notes and they sound virtually the same. In appearance, the trumpet looks a bit longer and more slender than a cornet. The real difference has to do with the way the tubing of the instrument flares. A cornet is more cone shaped or conical than a trumpet." Several weeks ago, cornetist, composer, and all-around great person Stephen Haynes sent an email blast about a new project that has taken several years to bring to fruition. 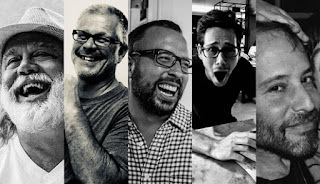 Knuckleball features Mr. Haynes in a brass quartet plus drummer that makes its debut on Tuesday June 12 at 7:30 p.m. at Real Art Ways, 56 Arbor Street in Hartford. 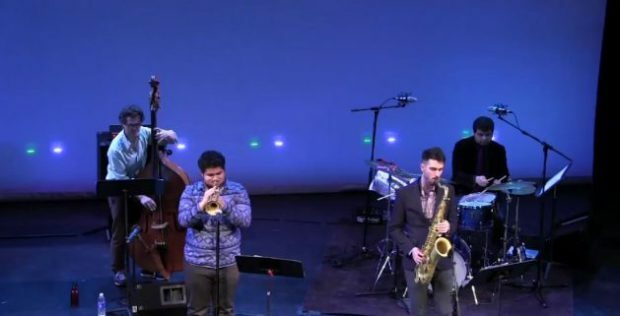 The quintet (see above) includes three cornetists - Mr. Haynes, Taylor Ho Bynum, and Los Angeles-resident Dan Clucas - plus Ben Stapp (tuba) and Eric Rosenthal (drums and percussion). Stapp is one of the finer young tuba players, ranking alongside Jose Davila (Henry Threadgill's Zooid) and Dan Peck (Anthony Braxton, Tony Malaby's Novela) as someone who has moved the instrument into the forefront of creative music. Rosenthal, a Wesleyan graduate (as is Bynum), lives in Boston and is a long-time member of the Klezmer group Shirim and its more "radical" offshoot, Naftule's Dream. Taylor Ho Bynum should need no introduction as he has been active on the CT music scene (as well as the international stage) for the better part of two decades. One of the founders of Firehouse 12 Records, he has worked and recorded alongside Anthony Braxton since his Wesleyan days (and nights) as well as with guitarist Mary Halvorson, drummer Tomas Fujiwara, the late conceptualist and trumpeter Bill Dixon, and has several duo recordings with drummer Rosenthal as well as Mr. Haynes. Dan Clucas is a new name to me: one listen to his albums, especially the two solo dates, on his Bandcamp page (danclucas.bandcamp.com) and you'll hear how he should fit right into this mass of brass. I understand how audiences might look a bit askance at this lineup, expecting a lot of noise and not much else. Yet, my experience with the music that these people create has taught me that, yes, it can be challenging but it is created with love, humor, honesty, and respect for each other and the creative process. And, the experience is often better in concert than on recordings (not to knock the recorded output of any creative musician) as you can the performers communicate, sweat, act, react, interact, and take the music to places even they don't expect it to go. For more information and reservations, go to www.realartways.org/event/knuckleball/2018-06-12/. 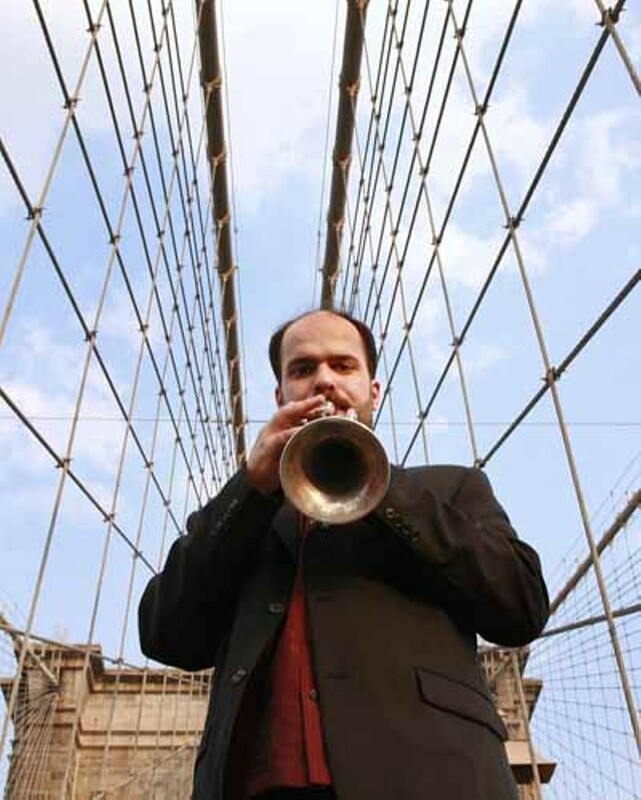 Amir ElSaffar, who was recently heard in New Haven performing at Firehouse 12 with Jamie Baum's Septet+, returns to the city on Sunday June 17 to play a live concert on the New Haven Green as part of the Arts & Ideas Fest. This time, he's bringing 10 members of his Rivers of Sound Orchestra, adding 13 members of the New Haven Symphony Orchestra, and performing a program of nearly-all new music! Last June, New Amsterdam Records issued ElSaffar's stunning two-CD set, "Not Two", a recording that combined the composer's study of Middle Eastern maqams and the use of stringed instruments such as the oud and the santir (hammered dulcimer) as well as his study of vocal styles and various percussion. The results (reviewed here), are entrancing, moving, and an aural delight. This Sunday performance is free and open to the public. Bring your lawn chairs, blankets, snacks, children, grandparents, and more to luxuriate in this fascinating music. For more information, go to www.artidea.org/amirelsaffar. 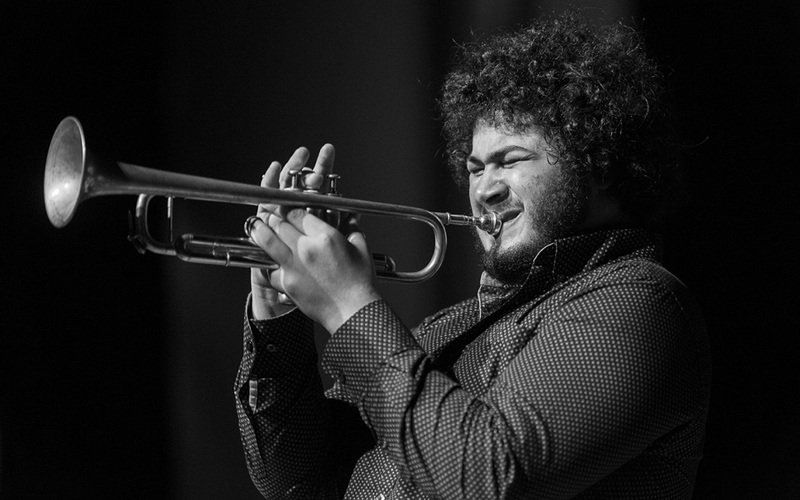 Trumpeter and composer Adam O'Farrill, the 23-year old son of composer/pianist Arturo O"Farrill and grandson on composer/arranger Chico O'Farrill, has been active on the contemporary music scene from an early age. He and his older brother, drummer Zack, formed the O"Farrill Brothers Band and released two albums for the ZOHO label, the first in November of 2010 and the other in December of 2012. 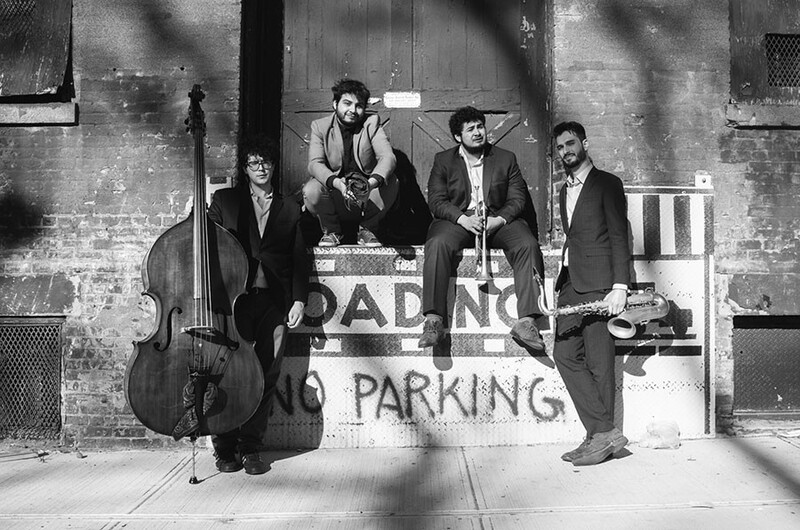 In 2014, he formed a new quartet with brother Zack, tenor saxophonist Chad Leftkowitz-Brown, and bassist Walter Stinson. After touring and recording with saxophonist Rudresh Mahanthappa's Birdcall and bassist Stephan Crump's Rhombal, O'Farrill issued his group's debut disk on Sunnyside Records: "Stranger Days" emphasized powerful rhythms, great group interaction, and intelligent melodies, with a sound that captures the listener on the first note. 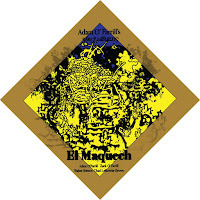 2018 finds the quartet, now dubbed Adam O'Farrill's Stranger Days, moving to Biophilia Records for its second album "El Maquech". All the elements that made the group's debut s appealing are evident here and more. The majority of the new album was recorded in April of 2017 in Montreal, Quebec, Canada, as the group was in the midst of its first tour. The team of Stinson and Zack O'Farrill truly push the music forward, not just supporting the trumpet and saxophone, but challenging them (as the excellent compositions) to take the music in fascinating directions. Therefore, pieces such as "Verboten Chant" and "Henry Ford Hospital" kick and strut with rhythmic variations and harmonic interactions. Plus, such fire! Listen to how the composer utilizes the front line before heading into solos. On "...Ford..", Leftkowitz-Brown comes blessing out of the "head" with a head of steam. He and the trumpeter engage in a bit of call-and-response as well as unison "splats" before "O'Farrill steps out for a blazing trumpet solo. Both "Henry Ford Hospital" and the title track (named for a beetle indigenous to the Yucatan Peninsula in Mexico) were inspired by artist Frida Kahlo (1907-1954). The latter tune is built off a traditional Mexican melody that the trumpeter found on a recording by Orquesta Jaranera Sonora Yucateca. It's fun to compare the two versions: the Orquesta makes the melody dance, especially thanks to the pounding drums and percussion while the newer version is respectful of the melody and rhythm (excellent work by Zack O). After the quartet throughly exposes the melody and harmony, the solos start to move into a "freer" territory. Even as the bass and drums stick to the rhythm patterns, the trumpet and sax take a number of liberties (notice how the rhythm goes into a short swing section before a spirited restatement of the opening melody). There are two tracks that also call out to be mentioned. "Shall We" is a duet for trumpet and drums, a quick frolic that is playful, displaying the love and respect the brothers have for each other and their joy for making music. "Get Thee Behind Me Satan", a spiritual that O'Farrill first heard sung by Ella Fitzgerald in the 2012 Paul Thomas Anderson movie "The Master", is performed as a trumpet solo. It's fascinating to hear he plays the melody, breaks down the tempo as the music moves along, going into rubato, his breathiness, the echo, and how the young man brings the piece to a close. It's a visceral shock when, just seconds later, "Henry Ford Hospital" opens with its brash clarion-call of sax and trumpet. 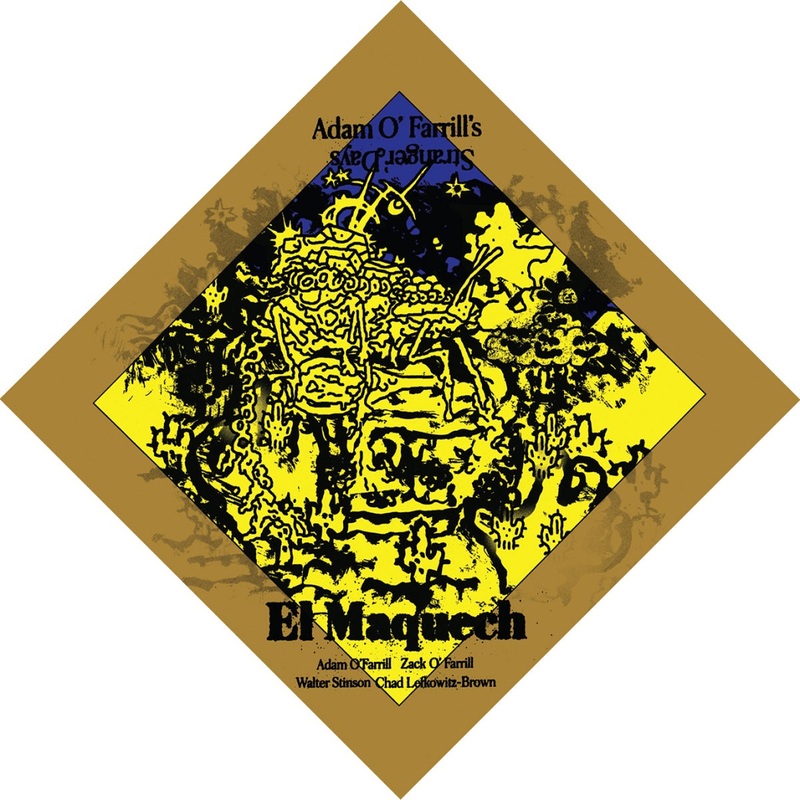 "El Maquech" is not just an impressive sophomore album from Adam O'Farrill's Stranger Days, it's a powerful reminder of creative music keeps growing, taking elements from different cultures, making music that is fresh and challenging. Enjoy the roar but also pay attention to how the musicians work together, fitting their sounds to the leader's vision. Don't ignore this album and definitely see this band live!! In keeping with Biophilia Record's mission statement, the music is issued as a download. If you buy it from the label, you receive in the mail the fascinating origami art work and a download code. For more information, go to www.adam-ofarrill.com and www.biophiliarecords.com/artist/?id=880174455.